Following an expansion of production facilities, workers had been experiencing uncomfortable working conditions due to excess heat caused by the blown film extruders. Although Aintree Plastics already had a ventilation system in place which helped to alleviate the problem, conditions were still unpleasant for personnel working near to the machinery. The company’s products are used extensively in the food industry and due to strict hygiene rules, doors and windows cannot simply be opened as this could allow the entry of insects and other contaminants. 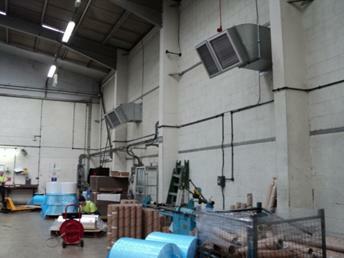 Evaporative Cooling System at Aintree PlasticsENSOL conducted a survey which determined the best solution to be the introduction of cool fresh air into the working area using four Evaporative Coolers ducted via the sidewall at low level. 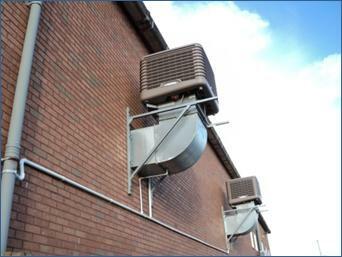 Using Evaporative Coolers meant that the entering air temperature could be lowered by up to 10°C resulting in much better conditions than could be achieved with fresh air inlet ventilation alone. Aintree Plastics Evaporative Cooling SystemsThe coolers contain pads on each of four sides which are continually wetted. When the air is drawn across them by the integral fan, the humidity level rises but the temperature decreases which results in cooler air being introduced into the building. This process is known as adiabatic or evaporative cooling. The cooled air is also filtered by the integral fly mesh screens and action of the wetted pads. Following the installation, the cooling system has reduced the working temperatures significantly and improved the working conditions well above expectations.